This article is not about how you design and format a resume. It’s not about how wide to make the margins or if you should use boldface type. Instead, this article is about clarity of vision, intention, and goal. In this globally competitive market, building a resume that shouts “hire me” is more salesmanship than listing facts. It’s more about answering countless questions you don’t preview or necessarily expect so you can convince someone you don’t know, can’t see or talk with why you are the next best thing since sliced bread and should be the one to fill that position. Maybe think of it as the first time you meet your fiancé’s parents. What do you want them to know or believe about you and still come across as real and trustworthy? First, your resume is more about your future than your past. Stress experiences most relevant to the career you aspire to hold. For example, if you want to be a clinical research associate, make sure you include how you volunteered with the Red Cross during the aftermath of Hurricane Harvey and that part-time job in which you helped a local ophthalmologist register her new medical device. Second, it should not resemble an autobiography. Best not to include every job you have held unless it can be made relevant to the position you want. For instance, suppose you want to coordinate projects. Though you got no pay and did it a few years ago, it might be worth mentioning how you organized a local program for teaching English to non-English speaking adults. Third, don’t bury your skill-sets. Skill sets belong at the top of your resume with relevant keywords. Of course, it’s crucial to keep your skills updated. If you want a job working with the MS Access Program, keyword searches will help to express your desire. Finally, make it easy and transparent for the hiring manager to like you on paper. Go ahead and include embedded hyperlinks to your former employer’s sites. Also, add your website or blog or other social media sites IF they are relevant to the position you are seeking or reflect your achievements. Most companies will scan for keywords to locate qualified candidates. Your keywords need to get you past the slush pile to the hiring manager. Once there, the “salesmanship” effort you deliberated over and worded carefully should gain you an interview. 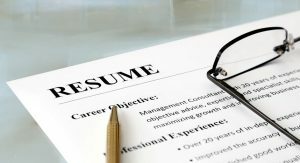 Perhaps most of all, realize each resume you send anywhere should be custom targeted for that position. Patrick Whelan Associates, Inc. provides professional recruiting services in the Albany, NY area. Our honest and transparent approach to assisting clients and candidates have led to building long-term relationships with rock-solid values. What Can We Learn from Stellar Salespeople? Is the Opioid Crisis Affecting your Company?